Your product descriptions can often be the determining factor between a customer buying from you or a competitor. As it becomes harder and harder to compete on price, especially in popular niches, users are always looking for ways to differentiate businesses and make their choices. Different products suit different niches. Women’s clothing is a vastly different market to that of pool filters and pumps. It stands to reason, then, that the language you use to connect with each audience would be different too. The best way to think about how you’d sell a certain product is to imagine you have a physical store and are talking to the customer face-to-face. What type of language would you use and how much explanation would a person buying from your store need? Deciding on your ideal buyer is also about your position in your market and whether you sell primarily B2B or B2C. Business owners and manufacturers get excited about specifications, however, the majority of customers do not. People generally look for the why, not the what, and listing a series of measurements and technical details won’t effectively bridge the gap between the product and the potential purchaser. People look for products to make their lives easier. Apple speaks directly to the need for fast, simple solutions and gives the impression that their new phone will solve a multitude of problems for the time poor. Using subjective phrases and unqualified superlatives is a quick way to remove the impact from your descriptions. Stick to the product and abstain from talking vaguely about its “top-quality” without backing it up. What makes it top-quality and how will this benefit the buyer? Tie everything back to the user experience and how your product will solve their problem to ensure it is always customer-centric. Samsung’s TVs make an outrageous claim, then follow it up with why they feel confident in it, while not veering off into a list of technical details. No one wants to feel like they’re buying a boring product from a boring company. 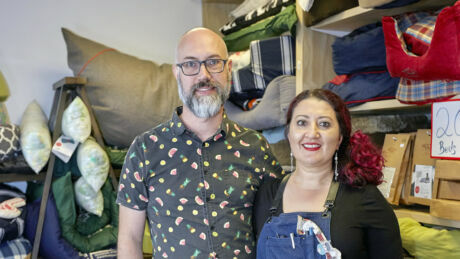 Whenever a buyer hands over their hard earned cash they want to believe that they are purchasing from a business with vision and creativity, whether it’s a new computer or a ball of wool. Your story doesn’t have to be wacky or zany or off the wall, but you should define and use a tone of voice that connects with the reader. The old writing adage of “show don’t tell” is probably more apt for copywriting, and demonstrating a product’s unique aspects rather than just describing them will have a bigger impact. The way words look on a page is as important as the words themselves. Your layout should be scannable for readers and include different font sizes to highlight important parts, bold headings to give the piece structure, and a bullet list to outline the three or four most important details. Nothing is less interesting for a reader who wants to make a purchase than a wall of text. Your layout needs to lead the reader’s eye down the page and pick out the key points for them. When you consider all of these tips, you should be able to easily write killer product descriptions that provide your customers with a better decision-making tool. If you haven’t mastered the craft yet, practice makes perfect!